Coconut benefits - Have you ever thought there are so many benefits for coconut? Coconut is widely used in southern part of India. It has got several benefits, and is used in many ayurvedic medicines also. Coconut is mainly used for cooking recipes, oil purpose, pooja purposes, and for medicinal purposes. Three stages of coconuts are used in India. In Kerala, the land of coconuts,coconut is used routinely in cooking and the oil is used for several purposes like cooking and medicinal need. 1. Tender coconut - Juice of tender coconut is consumed as a healthy drink, in many parts of South India. The juice is considered as having several health benefits. 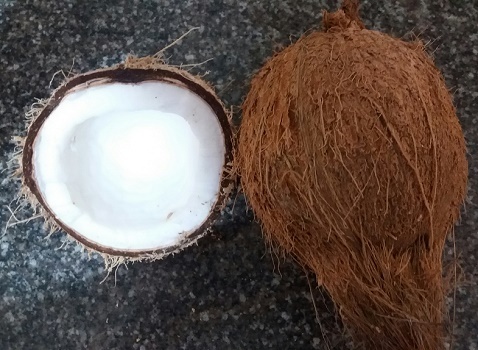 The fleshy part of the tender coconut is also used for making recipes or just for eating. 2. Moderately matured coconut - The white inside part of the coconut is used for making several delicious curries, and puddings. It is also used for extracting oil. Juice is also used for drinking, and adding in dishes to enhance its quality. 3. Well matured coconuts called "Copra" - Copra is also used in various recipes. Coconut uses are many and also used in various Home remedies. Tender coconut water is considered as world's best natural drink for being nutritious and thirst quencher. Tender coconut water relieves headache caused by overexposure to the sun. During diarrhoea, tender coconut water is an ideal drink to replenish the lost fluids in the body, which works like an electrolyte. Old coconut oil is a great healer of wounds. For enhancing complexion, face pack with coconut oil and oatmeal powder with a little bit of lavender flower powder is used. Coconut water is used in treating urine retention from heat. Coconut with spices like cinnamon,cloves,cardamom, garlics, turmeric makes a recipe very tasty and heals the digestive system and promotes better metabolism. Coconut milk is useful in generalized itching. Women in southern India applies coconut oil to their hair, which gives them long and healthy hair. Coconut is helpful in building up the body muscles of thin and emaciated individuals. Coconut is helpful in treating sore throat as well as relieving stomach ulcers. Coconut oil is used as a facial massage for the purpose of removing wrinkles. Tender Coconut water is good for kidney and urinary bladder problems. Coconut oil is used widely for healthy hair and skin. Coconut oil, mixed with some olive oil is a useful home remedy for dryness of skin. Thus, coconut benefits are many in number.